Peel away the surface of reality with a killer piece of weird like no other. You start by taking out a deck of cards from the box and as you are shuffling them you say that you are going to do something that is really strange, but more importantly, that you will do it very slowly. You have someone select a card, they sign it and it gets lost back into the deck. The deck is given to your spectator to shuffle, as you state that the card is going to vanish from the deck and appear inside the card box which is shown empty and placed on the table or given to another spectator to hold. 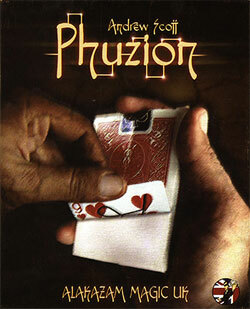 You have the person with the cards hold onto them real tight and before they know it – boom – it’s gone! The spectator checks through the deck and the signed card has completely vanished! You point to the card case the other spectator is holding – it’s empty. But…you point out the back of the card case looks the same as the back of a card. Now for the freakiest thing ever, slowly you start peeling the printed back design from the box! It leaves behind a white surface and you turn over the surface that you have torn away – all attention is focused on this strange object that is the signed selected card! Includes Gimmicks and Instructional DVD which outlines Peter Nardi’s & Jack Allibone’s commercial handling for the 4 phase card under box routine utilising Phuzion as the killer ending !